Did you know your outdoor lighting needs maintenance too? Although it’s cold outside and we want to spend as little time outdoors as possible, some of your equipment needs maintenance performed to last through the cold weather. Outdoor lighting is among this equipment that requires maintenance, as snow and ice can ruin it. Here are some tips for outdoor lighting maintenance to get done as quickly as possible before heading back indoors! Outdoor lighting is meant to be bright and light up a path in the dark, but your lighting can’t do its job if the lenses aren’t clean. Take a few minutes now and then to make sure your lenses are clean of dirt, debris, and mineral deposits, especially on low setting ground fixtures. You should also clear off lighting after a big snowstorm, as LED bulbs don’t produce enough heat to melt the snow or ice. Simply use a nonabrasive cloth to clean the lense and keep your lights bright all winter long. Ice and snow eventually melt, which can lead to system outlet issues for your outdoor lighting. A common issue is a GFCI outlet has been tripped, which will require you to hit the reset button on the outlet and ensure the cover is closed. If the cover is damaged, you will need to think about getting it replaced as not to create any more issues. 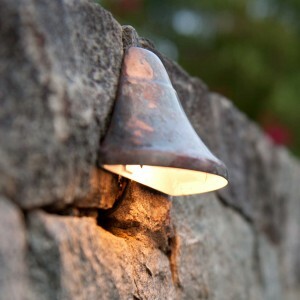 Due to the freezing cold temperatures in Maryland lately, make sure you check all bulbs of your outdoor lighting. The extreme temperatures can shorten the length of a bulb, and once a bulb has burned out, it should be replaced immediately. This is because when a bulb burns out, nearby bulbs may receive more voltage, causing their lives to shorten. If the ground is icy, a wire can work its way up to the surface and cause problems. Check all of your outdoor lighting wirings, and if you see an exposed wires, rebury them before the ground freezes again. However, first inspect the wire to ensure it has not been damaged by the weather, as damaged wires should be repaired by a professional. As a reminder, use caution when working with outdoor lighting and electricity. This entry was posted on Friday, January 5th, 2018	at 4:37 pm	. You can follow any responses to this entry through the RSS 2.0	feed. Both comments and pings are currently closed.